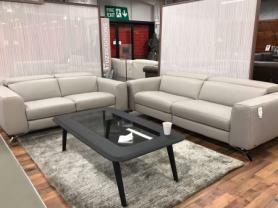 Made in beautiful thick Italian protecta family friendly leather , this pocket sprung high back power reclining corner sofa is amazingly comfortable. Whisper quiet power recliner on each end with USB charging ports is brilliant for them special relaxing moments. High grade thick leather all over. Approximate Measurements: 240 cm x 240 cm. Depth 98 cm.